The Friends For Life! Walk™ presented by Pedigree® is taking place across the province on the weekend of September 24-25! Follow us on Facebook, Twitter and Instagram to keep current on the latest giveaways, flash contests and everything you need to get you and your pup ready for the walk! The Friends for Life! Walk™ is a major fundraiser for the Ontario SPCA and its Affiliates. You don’t need to bring a dog to the walk to participate. In fact, you don’t even need to own a pet! The Friends for Life! Walk™ is a way for you to give back to your community by helping animals in need. We can’t do this alone, which is why we need you to go the extra mile to help vulnerable animals. Did you know that dogs have a limited ability to sweat and that even a short time in a hot environment can be life-threatening? A dog’s normal body temperature is about 39°C, a temperature of 41°C can be withstood only for a very short time before irreparable brain damage or even death can occur. We need you to help spread the message about the danger of leaving pets unattended in vehicles. Take the pledge to receive a No Hot Pets car decal to show your support. You can also invite friends to take the pledge on social media using #nohotpets for a chance to win a weekly “cool pet” prize. Pet overpopulation is at a crisis level in Ontario and we need responsible pet owners like you to spay it forward. By spaying or neutering your pet, you’re doing your part to help reduce the number of homeless animals that end up in animal centres across the province. Spaying and neutering is a straight-forward medical procedure with many health benefits, including the reduction in the risk of developing certain cancers and illnesses. The Ontario SPCA’s high-volume spay/neuter clinics are open Monday to Friday, with one Saturday each month. 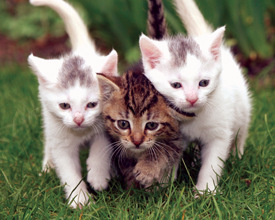 Have you been considering adding a cat to your family? Now’s the best time! Ontario SPCA Animal Centres across the province will be taking part in an “iAdopt Urgent Appeal” adoption blitz from Aug. 11-21 to help find homes for the recent influx of adult cats in our care. During this urgent appeal adoption blitz, ALL ADULT CATS will be available for adoption for $50 each*. All cats are spayed or neutered, microchipped, come with a gift of six weeks of pet insurance and are up to date with their vaccines. 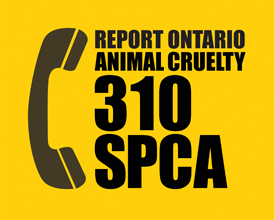 Find your local Ontario SPCA Animal Centre. 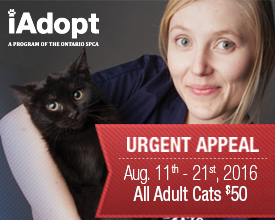 *Special adoption fee applies to participating Ontario SPCA Animal Centres only. If you’re a pet owner who loves to cook or bake, making your own healthy pet treats can be fun and rewarding. It’s a great way to spend some time with your four-legged friend, plus you’ll know exactly what’s in the treats they’re eating. 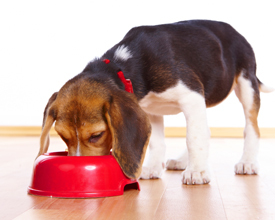 To help you get started, we have a few recipes we think your pets will love! Back in June we told you about a removal of Yorkie and Maltese-type dogs from a property in Eastern Ontario. 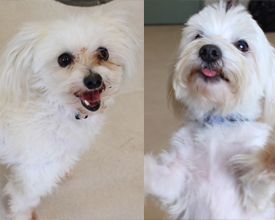 We’re excited to report that two dogs from that rescue found homes last week! Congratulations to Bubblegum and Gobstopper and their new families. We wish them the best of luck! More dogs from that investigation, including puppies, will be available for adoption in the coming months, so stay tuned!